Families in Global Transition - Get Involved! 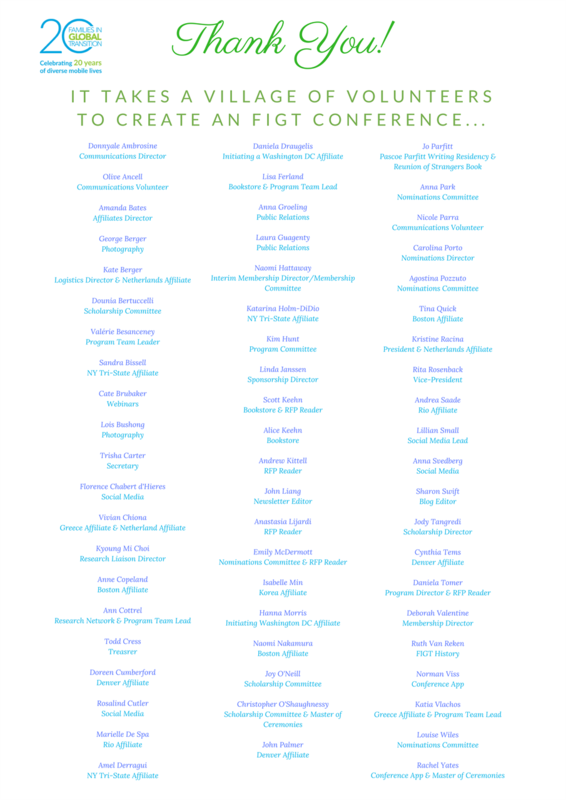 Without the time, skills, dedication, commitment and belief in FIGT’s mission of our Board of Directors and other invaluable volunteer members, FIGT would not be what it is. From planning our Annual Conference, to managing the day-to-day operations of the organization, it is the people behind the scenes that make the difference and gain the most. Opportunities exist at either Board or Committee level. Board vacancies are announced each year in the Spring when members are invited to apply for the vacant positions. Committee positions are more dynamic and members may become involved as volunteers at any time during the year but are particularly welcome as we prepare for the annual conference. Please complete the brief online form or e-mail volunteers@figt.org. We will be in touch to talk about your interest and to let you know about any opportunities. If we do not have any appropriate roles available at this point, we will let you know and with your permission keep your details on file for use as and when new opportunities arise. Vacancies that we are unable to fill from our volunteer pool are advertised on social media. If you have questions about becoming a member don’t hesitate to get in touch with our Membership Director at membership@figt.org. If you’re an #FIGTMember and you’d like to get involved in one of the above roles, please email Anne Lessle at communicationsmanager@figt.org to learn more!